TransCanada is blading a 50-ft. swath across the Sierra Tarahumara – one of the most rugged, inaccessible regions of Mexico. The energy transfer and story corporation is clearing a path of natural destruction to lay a 30-inch gas pipeline. When completed, the pipeline will carry natural gas – a product largely of hydraulic fracturing (fracking) – from U.S. drilling fields. Connecting with the Tarahumara Pipeline that runs from the U.S.-Mexico border to south of Chihuahua City, the new TransCanada pipeline – Encino-Topolobampo Pipeline--will channel U.S. gas surpluses across the Sierra Tarahumara to fuel new electricity -generating plants on the west side of the mountain range. In Mexico, TransCanada operates with the blessing of the Mexican government. As Mexico has opened up its energy market to foreign investors and foreign energy, TransCanada has jumped in with $5 billion in energy-infrastructure investment. The new gas pipeline across the mountains and canyons of the Sierra Tarahumara in the border state of Chihuahua is one of more than two-dozen gas pipelines or gasoductos that are being constructed across northern and central Mexico. In the United States, TransCanada became known as a dirty-energy company because of its project to build the Keystone XL Pipeline. The Keystone XL Pipeline would have pumped carbon-heavy crude oil from Canadian oil sands across mid-America to energy refineries on the coast of the Gulf of Mexico. Under pressure from environmentalists from around the world, the Obama administration denied TransCanada permission for the controversial pipeline project, noting that it wouldn’t serve U.S. national interests and would contribute to global climate change. In contrast, the Mexican government argues that the TransCanada project in the Sierra Tarahumara and the many other transnational and transregional gasoductos serve the country’s national interests and reduce carbon emissions. Most observers agree with the government’s argument in favor of a massive network of U.S.-sourced gasoductos. Advocates of transferring U.S. natural gas to Mexico point to the relatively low cost of natural gas imports, the absence of dependable Mexican gas production, and the advantages of converting the country’s generating plants from coal and oil to cleaner natural gas. Neither in the United States nor in Mexico has there been much public discussion or policy debate about the rapidly changing transborder energy market. Mexico’s new tapping of U.S. gas reserves has precipitated a frenzy of pipeline construction both in the United States and in Mexico. For the most part, the new U.S.-Mexico pipelines cross sparsely inhabited arid regions in the Sonoran and Chihuahuan Deserts. As such the massive construction projects have sparked little public reaction. The national electricity system in Mexico is undergoing a radical overhaul. Proponents assert that the reform will ensure a more fiscally and environmentally sustainable system. The market-oriented reform enjoys widespread support because of the embarrassing dysfunction of the government-owned grid. Electricity prices, losses because of faulty infrastructure, losses from theft, and annual budget deficits make Mexico’s electricity system one of the most expensive and least efficient in the developed world. Political and populist pressures have created a clunky system burdened by exorbitant subsidies. What is more, electricity generation has long been dependent on especially dirty fuels, notably low-quality coal and oil. The future of electricity generation, transmission, and service is uncertain as the government opens up all facets of the electricity system to private companies, including foreign corporations such as General Electric. The reform of Mexico’s national electricity system has been the subject of little public attention, political dispute, or congressional debate. Rather than being introduced as a separate bill, the Peña Nieto administration folded the proposed liberalization of the electricity system into the national energy reform bill, which became law in December 2013. The contentious debate over the highly controversial energy reform focused on Mexico’s oil sector, which since the late 1930s has been managed by the state-owned Petróleos Mexicanos (PEMEX). The nationalization of foreign oil companies by President Cuauhtémoc Cárdenas and the subsequent creation of PEMEX were among the most heralded accomplishments of the post-revolutionary regime controlled by PRI political party. The PRI controlled Mexico for seven decades, losing the presidency to the National Action Party (PAN) in 2000. In December 2012, the PRI -- with Enrique Peña Nieto as its presidential candidate -- reassumed its position as ruling party after two sexenios (6-year terms) by PAN presidents. Although traditionally opposed to the privatization and free market ideas advocated by the conservative PAN, the PRI since the 1980s has increasingly advocated the liberalization of the Mexican economy through free trade agreements and the transfer of state-owned corporations to private investors. President Peña Nieto’s proposed liberalization of the national energy system counted on near-total support of the nation’s two largest political parties, namely PRI and PAN. As expected, the reform – which for the first time substantially opened the industry to private (including foreign firms) investment and control – encountered strong opposition from the left parties, principally PRD and the newly constituted MORENA, as well as from the powerful and shamelessly corrupt PEMEX workers’ union STPRM. The government of President Enrique Peña Nieto promises that the liberalization of Mexico’s national electricity system will increase efficiency and lower prices. But the sordid history of the liberalization of other previously state-owned sectors –most notoriously banking, mining, communications, and railways in the 1980s and 1990s – justifies some skepticism. Five years ago a plan for a new water megaproject -- aqueduct transferring water from the Yaqui River to the capital city of Hermosillo -- ignited a water war in the border state of Sonora. The conflict divided the arid northern Mexican state into two diverse and bitterly opposed pro- and anti-aqueduct alliances– with all the diverse contenders claiming that justice and the rule-of-law were on their side. Intermittent blockades of Sonora's main north-south highway by Yaqui anti-aqueduct militants continue. And the anti-aqueduct ¨No al Novillo¨ coalition gained national support from an array of environmental organizations, anti-water privatization groups, and indigenous solidarity organizations as well as by many progressive intellectuals. Yet the forces in favor of hydraulic solutions to the water demands by the state's leading economic sectors and by the state capital of Hermosillo have prevailed. On the most basic and superficial level, the transfer of water from the Río Yaqui to Hermosillo (which lies in the depleted Río Sonora/Río San Miguel water basin) was a determination that emerged from the democratic process. In the Mexican political tradition in which governors and presidents launch megaprojects to shape the legacy of their sexenios (six-year governing periods), Governor Guillermo Padrés Elías launched the Sonora SI water infrastructure program a few months after his term began in late 2009. A leading member of the National Action Party in Sonora, Governor Padrés could count on support of then-President Felipe Calderón and the federal agencies under the control of the PAN government in Mexico City. 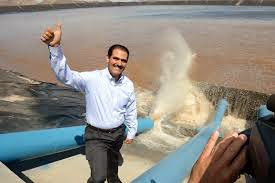 In launching this program of water megaprojects, the new governor was also renewing a history of massive, often badly planned hydraulic projects in Sonora dating back to the early 1940s and continuing into the early 1990s. Presa Plutarco Elías Calles. But it is best known as El Novillo, the name of village in the eastern municipio of Soyopa. The dam and reservoir did increase the water available for irrigation and helped diminish flooding down river. But like most major dams, El Novillo displaced hundreds of people from small towns in the mid-basin of the Yaqui River, and these families continue to demand that the federal government compensate them adequately for losing their land and livelihoods. The announcement by the state government, with the close collaboration of the federal government, would begin construction of the Independencia aqueduct set off a new configuration of political forces in Sonora based on accelerating tensions between the Valle del Yaqui and Hermosillo. With PAN and the Hermosillo-based PRD largely supporting the Sonora SI megaprojects including the highly controversial Independencia aqueduct, leading figures within the PRI (which was the leading opposition party both in Sonora and nationally), particularly those based in the Yaqui valley, joined the widening opposition to aqueduct. The a leading faction of the Yaquis -- an indigenous people legendary throughout Mexico for their fierce resistance to Spanish and Mexican attempts to usurp their water and occupy their homeland -- formed the militant vanguard of Yaqui Valley anti-aqueduct alliance. governmental sponsors along with the residents and industries of Hermosillo, which are Sonora’s state capital and most populous city. Aside from the power dynamics of the water war, each side is emboldened by strong convictions of entitlement -- with those raising their voices saying “No al Novillo” or “Sí al Independencia” all believing that they had law, reason, and justice on their side. The north and south highway blockades, where the toll highway passes through the Yaqui town of Vicam north of Cd. Obregón, formed the frontlines of the Yaqui water war (and the continuing although diminished Yaqui protests). Despite tremendous economic and political pressure to let the traffic and commerce flow freely, the Yaquis together with their allies in the “No al Novillo” coalition refused to accede, keeping up the blockades even when summer temperatures soar to 110 or 120 degrees or more. This water war also played out on numerous other fronts, each of which sheds light on the shadows that obscure and diffuse the rule of law and democratic governance in Mexico. Enough Water to Go Around? The two opposing sides of the Yaqui water war look at the three dams on the Yaqui River quite differently. The pro-aqueduct “Agua Para Todos” forces, mainly based in government and business in Hermosillo, look at the map of Sonora and see the three largest expanses of surface water in the state situated behind these dams on Yaqui River. The Independencia backers point to the years of above-average precipitation or periods after the summer monsoon rains. At those times, the reservoirs sometimes capture more water than their cement curtains can contain, obligating CONAGUA and state water managers to release excess water and allowing water to flow into the Gulf of California. For the agribusiness and industrial sectors of the Hermosillo area and for the city’s domestic water consumers, images of the Yaqui River running into the sea -- as it did before the damming of the river – amounts to a sacrilege, a waste of fresh water in arid land. Voices that note that the health of the Mar de Cortés and its estuaries depend on these flows of rich river water are not part of the water debate in Sonora. Coursing through their campaign to support the Independencia aqueduct is a sense of injustice that Sonora’s largest river is not more equitably shared. What aqueduct opponents find so infuriating is that Hermosillo has neither cared for its own water basin nor prioritized the domestic consumption of the water of the Hermosillo municipio, where only 2% of the water is for human consumption while 84% goes to agribusiness in the Costa de Hermosillo and elsewhere in the municipio. While the Novillo-Hermosillo conflict has focused on water flows of the Yaqui River, there has only been passing attention to issues of waste, distribution efficiency, and conservation either in the Yaqui Valley or in Hermosillo. As much as 40% in Hermosillo’s municipal water distribution is lost through leaks that often go unrepaired for days or weeks. Nicolás Pineda Pablos, a professor of public policy at the Colegio de Sonora observed that “the management problem is worse” than the problems posed by the actual supply of water. Prioritization is also a core management problem of limited water resources, according to Pineda. Water managers in Hermosillo or in state government have done virtually nothing to decrease water flows to agribusiness in any of the agribusiness centers of Sonora. “If you want to have big-city growth, you can’t also have agriculture,” Pineda told the New York Times. more they dispute the notion that there is more than enough water in the Yaqui River basin to regularly supply Hermosillo with 30 Mm3 to 75 Mm3 of river water. While not disputing the assertion that the monsoon season can sometimes deliver more rain than the dams can manage, the Yaqui Valley Irrigation District points to the many years in recent decades when the Angostura, Novillo, and Oviáchic reservoirs were far from capacity. In 2013, for example, the reservoirs on the Yaqui River held 44.9% of their capacity in late June. But ten years previously (2003) the reservoirs contained just 9.2% of their capacity at the same time of the year -- with El Novillo holding just 8.1% of its capacity. Leading figures in the “No al Novillo” coalition have conceded that during wet years there might enough water to channel 75,000 Mm3 to Hermosillo. But in dry years, which are increasingly common, the water consumers in the lower Yaqui River basin would experience severe water shortages, they contend. The State Water Commission, arguing in favor of the Novillo-Hermosillo aqueduct, contended that even if the aqueduct annually transferred the maximum 75 Mm3 of water to Hermosillo, this would represent 2.5-3% of all the water in the river basin. Such arguments fail to persuade opponents, who countered that the river was already over-committed and such estimations didn’t consider such factors as increasing and more prolonged droughts, evaporation losses, and unknown quantities of unregulated water extractions by mining companies, ranchers, and farmers. such basin councils are rare, and, furthermore, there are many cases of inter-basin transfers of water, including in the Mexico City region. Governor Padrés brandished what has been a winning pro-aqueduct argument for most Sonorans, namely that “Water is now for all Sonoroenses, and not longer for just a few.” It is an argument that resonates with the Mexican Constitution’s guarantee (albeit far from the reality) of potable water access for all Mexicans. Even as support for the governor plummeted in late summer 2014, public support (outside of the Yaqui Valley region) for the governor’s projects to dam and transfer water to water-poor urban and rural areas was little affected -- although the support came coupled with demands that these projects abide by the rule of law. The city’s commercial, construction, industrial, and agricultural elite and their associations stood at the forefront of statewide campaign in favor of the Novillo-Hermosillo aqueduct. The pro-aqueduct campaign also counted on the support of the State Water Commission (CEA) and Conagua, which provided most of the funds for the aqueduct. Recognizing that government pro-aqueduct propaganda, along with the imposition of the will and power of the state government, wasn’t enough to dissuade the opposition, the Padrés administration began loosening the state government’s purse strings (along with those of federal grants) to create a legal facade for the draining of the Yaqui River. Typical of Mexico’s governance practices, CEA staring buying water rights from small landholders along the middle Yaqui river basin as well as offering payouts to valley producers who would agree, at least rhetorically, to yield their water rights. Although CEA led the publicity campaign justifying the transfer of water, the state water commission had the firm backing of CONAGUA during the Calderón administration. In a July 2010 visit to Hermosillo, President Calderón gave the presidential blessing to the assertion by CONAGUA that it had secured almost 52 Mm3 of water from the Yaqui river basin that were not accounted for or distributed and which could therefore be transferred through the planned aqueduct. According to CONAGUA, this available Yaqui River water could be used to meet “the basic needs of the city and permit its development.” After the Calderón sexenio ended, CONAGUA became pronouncedly more distant from Padrés and CEA. But the federal government under President Enrique Peña Nieto continued granting funds for Sonora SI projects, including aqueducts and dams. Handing out government funds -- which remain largely unaccounted for -- did create a flimsy legal facade for the transfer of water rights to Hermosillo. Moreover, other government payouts to those who would express support for the aqueduct created divisions in the Yaqui valley, including among Yaquis themselves -- particularly those with a history of working for state government programs. The ¨No al Novillo¨/ Sonora SI that gripped the state for most of the Padrés Elías years as governor have proved to be a diversion from a serious public reflection on the state's water future and the sustainability of its economic development models -- especially agribusiness, mining, and uncontrolled urban growth in desert regions. The new PRI government of Governor Claudia Pavlovich will likely try to pacify Yaqui militancy and to build new alliance with the more conservative social and economic sectors of the Yaqui Valley by unleashing the party's well-practiced patronage schemes. Sonora SI will likely be dismantled but not the water megaprojects it sponsored. Yet the ability of the new PRI regime to consolidate control and power -- and to count on popular support -- in Sonora will be severely tested. For one thing, the PRI government of Peña Nieto is in ruins for an array of political, economic, and legal reasons. Making matters worse is the state of finances in Sonora -- with the outgoing PAN officials having effectively depleted the state treasury, leaving the state with an unprecedented public debt. The capacity, therefore, of Governor Pavlovich to put the state together again with party favors and handouts is limited. Just one sign of the chaotic state of Sonora's finances is the failure of the State Water Commission to pay the small farmers along the Yaqui River who supposedly sold their water rights as part of a plan that would allow CEA, CONAGUA, and Sonora SI to claim that there was enough water in the Yaqui River to supply Hermosillo through the new aqueduct. As the new PRI administration takes control of Sonora, it will surely face new water wars and new water crises. Looking back over the forces that shaped the water battlegrounds of the past five years may help illustrate the challenges that lie ahead for the Yaquis, Hermosillo, and water users throughout the state. The Mexican border state of Sonora is expanding its hydraulic society in the face of climate change, an escalating water crisis, and indigenous opposition. This Center for International Policy investigative and policy report examines Sonora’s water crisis and the faltering condition of the state’s hydraulic society—a society largely shaped by and dependent on governmental water projects. A close look at the controversy over a new aqueduct pumping water from the Yaqui River illustrates the new water tensions that societies on both sides of the border are experiencing and underscores problematic and unsustainable responses to the water disaster developing across the transborder West. The first part of the report examines the issues directly associated with the Yaqui water war, while the second part examines the mining boom and impacts on the Sonora and Yaqui Rivers. Over the past four centuries, the Yaqui have routinely suffered the loss of their land, water, and autonomy despite fierce resistance. Throughout Mexico, the militancy of the Yaqui in the face of Spanish, U.S. and Mexican incursions and occupations is legendary. Even in Sonora, where the Yaqui have suffered campaigns of removal and extermination, they have achieved iconic status. Sculptures and images of Yaqui deer dancers are found everywhere in tourism promotion, on state highways, and on state buildings. The persistence of Yaqui demands for independence and of their resistance to attempts by investors and colonizers to occupy the Yaqui valley led to these military campaigns to eliminate the Yaqui. The wars against the Yaqui, especially during the Porfiriato (1876-1910), were, in effect, ethnocide campaigns. It wasn’t until a decade after the Mexican Revolution (1910-1917) that the Yaqui resistance was finally crushed in the revolutionary government’s 1926-1929 military campaign. Ciudad Obregón, which emerged as the center of the anti-aqueduct coalition, was named in honor of the revolutionary general and president Álvaro Obregón— but the original name of the settlement was Cajeme, the name the war name of the Yaqui leader Jose María Leyva. Cajeme led the Yaqui resistance against the Porfírio Díaz regime until he was executed in 1887. Cajeme remains the name of the county that includes Ciudad Obregón and several Yaqui towns. As president of Mexico, Obregón (who was born in the Mayo delta) played a key role in opening the Yaqui valley to foreign agricultural investors. By some measures, the Yaqui have fared better than other indigenous people in Sonora and elsewhere in northern Mexico. Dozens of other native groups no longer exist or whose small numbers presage eventual extinction. Today, about 30,000 Yaquis inhabit the Yaqui Valley, roughly the same number the Jesuits encountered in the early 1600s. Other Yaqui live scattered throughout Mexico and the United States, including the Yaqui community of Pascua outside of Tucson. From a certain perspective, the Yaqui have emerged over the centuries as victors since they first repelled the Spanish. Their victories— maintaining their language, gaining rights to a large part of their traditional homeland, and winning guarantees of their rights to half of the water flowing in the upper Yaqui river basin— set them apart from most other indigenous communities in Mexico. [ii] One has only to witness a meeting of Yaqui communities presided over by their gobernadores (governors) in their native Cahitan language to appreciate their endurance and determination. They maintain rights to one of the most coveted farming regions of northern Mexico despite the long history of occupation, including deportation campaigns, massacres, and enslavement in rubber plantations of Chiapas. But survival is a low measure of success. Relative to dominant mestizo and ladino (white elite) Sonoran society, the Yaqui are a marginalized people whose future prospects are grim. Unemployment is more than 70%, and 85% of Yaquis are impoverished. Few Yaqui have more than sixth-grade education. Infectious diseases, cancer, skin rashes, and digestive disorders run rampant through Yaqui communities. Many factors explain the social marginalization and impoverishment of the Yaqui people, mirroring more or less the same desperate circumstances facing most of Mexico’s indigenous population. But socioeconomic studies aren’t necessary to identify a central factor in keeping the Yaqui on the margins of the economic development that surrounds them. ● 96% have incomes less than $450 monthly. ● More than 90% have electricity in homes. ● More than 90% have access to piped but not purified water. Since the late 1930s, the Yaqui have generally acceded to the government’s modernization projects. The pacification of the Yaqui dates back to the initiatives of the Lázaro Cárdenas administration (1934-40) that included dams, agrarian reform and nationalization of foreign enterprises. Key to the government’s success in pacifying the Yaqui were two decrees by President Cárdenas: 1) granting the Yaqui title to 5,500 square kilometers (3,418 miles) of land, stretching from near Ciudad Obregón north to Guaymas; and 2) granting the Yaqui rights to half of the water to be captured by the La Angostura dam and reservoir. While the anti-aqueduct focus was on the PAN administration of Governor Pádres (and initially of President Calderón), the PRI has been the political party responsible for the water problems facing the Yaqui. Although the PRI government decreed that the Yaqui would have their own land and water, the government never took the necessary measures to ensure that the Yaqui would benefit from these decrees. Instead, the main beneficiaries have been the non-Yaqui farmers (large and small landholders) who have appropriated the water and occupied or rented Yaqui land. Never did the various PRI administrations help the Yaqui implement an agricultural development plan with agronomists, marketing experts, and infrastructure support. The construction of the Oviáchic dam by President Miquel Alemán’s administration helped consolidate the irrigation system using the Yaqui River directed to support the yoris or non-Yaqui. Other major assaults on Yaqui water resources by PRI governments in the 1980s and 1990s took the form of the massive unregulated extraction of surface water from La Angostura reservoir for the then-government owned copper mining operations near Nacozari and the federal government’s funding of a battery of wells to feed the Yaqui-Guaymas aqueduct. PRI governments— at both federal and state levels— bear primary responsibility for undermining Yaqui unity through various so-called development and modernization projects that leveraged existing differences among the Yaqui into a defined schism between leadership factions commonly described as the traditionals and the modernizers. Illustrative of Yaqui acceptance of projects that adversely affected their land and water rights was the 1991 agreement by the Yaqui leadership to permit the construction of the Yaqui-Guaymas aqueduct. In exchange for the promises that the government made to provide Yaqui communities with potable water, the Yaqui leadership, with minimal dissent, consented to a CONAGUA-funded project to drill a battery of water wells on Yaqui land to supply water to water-starved Guaymas, Empalme, and San Carlos. So when the federal, state, and local governments proceeded with plans for the Yaqui Valley-Guaymas aqueduct in the 1991, there was only scattered opposition. For the most part, the Yaqui communities have access to piped water. But the water is not purified, and is contaminated with agrochemicals, arsenic, and nitrates. Simply because there are water pipes, it doesn’t mean that water flows to Yaqui households. The Mayo people echoed Yaqui complaints about water availability and quality. They said that they now need to buy water to ensure that they don’t get sick, and that all the water in the wells, river, and irrigation canals is contaminated. In dry times, they claimed that the aquifer shrinks and that the water pipes get clogged with dirt. Another finding of the Colegio de Sonora report on indigenous communities and water was a condition that is readily observable in the deltas of the Colorado River (the traditional homeland of the Cucapás), Yaqui River, and Mayo River. “What stands out is access to land, which has fallen under the dominance of an agroindustrial type of development.” They note that water is the cross-cutting theme of indigenous survival and identity in Sonora. In marked contrast to the construction of the Yaqui Valley-Guaymas aqueduct, the Yaqui and the members of the Yaqui Valley Irrigation District reacted immediately and in unprecedented unity to the announcement of the planned Novillo-Hermosillo aqueduct. The Citizens Water Movement, based in Ciudad Obregón in southern Sonora, counted on the economic and political clout of the agribusiness sector of the Yaqui Valley. The north and south highway blockades of Vícam formed the frontlines of the Yaqui water war. Despite tremendous economic and political pressure to let the traffic and commerce flow freely, the Yaqui together with their allies in the “No al Novillo” coalition refused to accede, keeping up the blockades even when summer temperatures soar to 110 or 120 degrees or more. The militant Yaqui opponents of the aqueduct have continued the traffic blockades despite the unfavorable court rulings and the deflation locally and nationally of the anti-aqueduct movement and coalitions. This water war also played out on numerous other fronts, each of which sheds light on the shadows that obscure and diffuse the rule of law and democratic governance in Mexico. [ii] Among the major armed Yaqui rebellions were those of 174041,1764-67, 1825-33, 1840, 167-68, 1889-91, 1912-3 1918-19, and 1927-28. See Tonatiuh Castro Silva, “Las persistencia de la nación yaqui entre anhelos y despojos,” Sonora Biodiversidad, June 4, 2013. [v] Luque et al, p. 81.